MOUNTAIN VIEW, CA – Only five percent (5%) of customers were in the Medicare prescription drug plan (PDP) with the lowest total out-of-pocket costs available to them, according to an analysis of more than 100,000 user sessions that occurred on PlanPrescriber.com during the 2012 Medicare Annual Enrollment period. These findings are included in the 2012 Choice and Impact Study released today by PlanPrescriber (www.planprescriber.com), a wholly-owned subsidiary of eHealth, Inc. (NASDAQ: EHTH). The study found that only twenty-four percent (24%) of customers were in the Medicare Advantage prescription drug (MAPD) plan with the lowest total out-of-pocket costs available to them. The study also found that the average user who switched to the plan with the lowest total out-of-pocket costs in 2012 could have saved $654 over their existing PDP and $605 over their existing MAPD. In this analysis, user sessions constituted unique visits to PlanPrescriber.com where customers entered their ZIP code; the name of their existing Medicare prescription drug plan or Medicare Advantage prescription drug plan; and the names, dosages and frequency of any prescription drugs they were taking, if any. The Medicare plan comparison tool at PlanPrescriber.com compared the users’ existing plans to other plans available in their areas. The tool calculated all of the users’ known prescription drug costs, including monthly premiums, co-pays, coinsurance and deductibles. The tool then provided each user with an estimate of their total out-of-pocket costs for prescription drugs in the 2012 plan year. 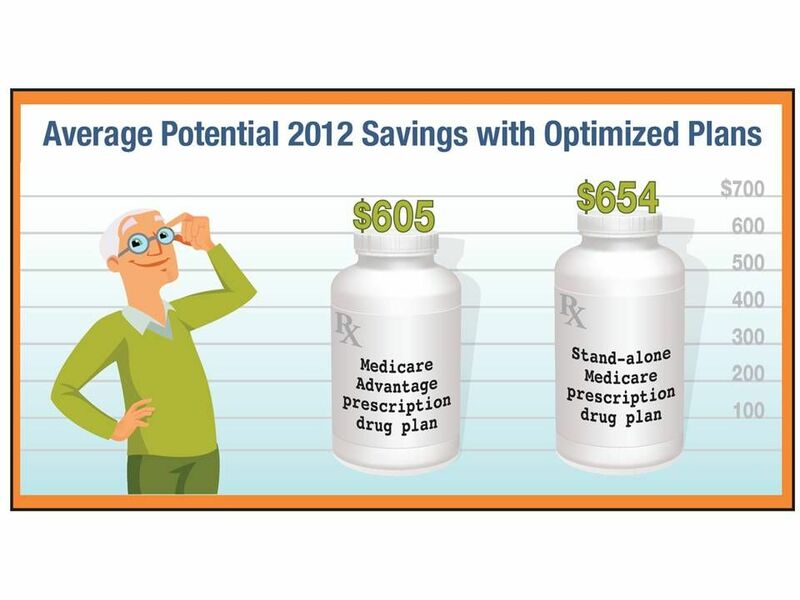 Between Oct. 15 and Dec. 7, 2011, over 12,000 user sessions were used to compare stand-alone Medicare prescription drug plans (PDP); and over 5,000 user sessions were used to compare Medicare Advantage prescription drug (MAPD) plans. The majority of users in both types of plans were not in the plan with the lowest total out-of-pocket prescription drug costs. This analysis from PlanPrescriber underscores the value of reviewing one’s Medicare prescription drug plan coverage during Medicare’s Annual Enrollment Period (AEP). In 2012 the AEP will take place between Oct. 15 and Dec. 7. However, only about 10 percent of Medicare Part D plan participants change their coverage annually1, according to a 2010 study by the Robert Wood Johnson Foundation. PlanPrescriber research also found that, in the 10 largest states in the country, the average PDP only covered about 67 percent (67%) of all drugs approved by Medicare, while the minimum number of drugs covered by a single plan in any market was around 49 percent. After calculating all cost — including monthly premiums, co-pays and deductibles — the session data found that changing to the plan with the lowest overall out-of-pocket costs could save the average user with a Medicare PDP $654 in 2012 and $605 for the average user with an MAPD. The analysis also found that the average customer would spend $2,076 per year with their existing Medicare PDP, and $1,980 per year with their existing MAPD. Changes in medication usage notwithstanding, the prices customers pay for their coverage can change significantly from year to year because many organizations change components of their drug plans each year. These changes may include the drugs covered on a plan, the premiums, deductibles, coinsurance, co-payments charged to enrollees and different drug tier systems being used by insurers, which assign different coinsurance and co-payments to drugs depending on their tier. Any one of these changes can significantly impact what beneficiaries pay out of their own pockets year to year on a Medicare Part D prescription drug plan. In many instances, the lowest-cost plan for an enrollee in one year is not the lowest-cost plan the following year. The actual savings calculated from these user sessions can vary depending on things like geographic location, plan selection and other factors. The benefits and coverage may also vary between plans; the average savings calculated in this report is based on the user sessions that took place exclusively at PlanPrescriber.com. The PlanPrescriber analysis also found that two-thirds (66%) of customers never hit the Medicare prescription drug coverage gap (the donut hole) in 2012 with their existing prescription drug plan or Medicare Advantage prescription drug plan. Among users who hit the donut hole, about half (52%) would hit the donut hole before September in their existing Medicare prescription drug plan. To download PlanPrescriber’s full 2011-2012 Medicare Annual Enrollment Period Beneficiary Choice & Impact Study, click here or visit the eHealth Media Center at news.eHealthInsurance.com. This report analyzes more than 100,000 user sessions that occurred on PlanPrescriber.com during the 2012 Medicare Annual Enrollment period, which took place between Oct. 15, 2011, and Dec. 7, 2011. During that time there were over 12,000 user sessions in which a person entered their current prescription drug plan (PDP) and at least one prescription drug they were taking, and over 5,000 user sessions in which a person entered their current Medicare Advantage prescription drug plan (MAPDP) and at least one prescription drug they were taking. The information users were required to provide in order to be counted as currently enrolled in a PDP or MAPDP included their ZIP code and the name of their existing Medicare prescription drug plan or Medicare Advantage plan. In these user sessions, customers also included the names, dosages and frequency of any prescription drugs they were taking. Their average savings were calculated by subtracting the customer’s total estimated out-of-pocket spending on their current plan — including monthly premiums, deductibles, coinsurance and co-payments — from the estimated out-of-pocket spending on the plan recommended by PlanPrescriber’s Medicare insurance plan comparison tool. For price comparison, this study assumes no changes in prescription or medical needs, as well as no changes in rates or drug prices during the applicable time period. NOTE: Medicare beneficiaries base their plan selections on a variety of priorities, including price. PlanPrescriber encourages people to consider their specific needs in deciding which plans to select during the Annual Enrollment Period. Plan data listed in this report might change based on additional data received from the Centers for Medicare & Medicaid Servicers (CMS) at a date later than the active date of the data or later than the published date of this report. PlanPrescriber (www.planprescriber.com), a wholly-owned subsidiary of eHealth, Inc., is a leading provider of unbiased comparison tools and educational materials for Medicare Advantage, Medicare Part D Prescription Drug Plans, and Medicare Supplement insurance products. Medicare beneficiaries can take advantage of PlanPrescriber's no-cost online advisor tools by logging on to http://www.PlanPrescriber.com. PlanPrescriber is a tool designed to help Medicare beneficiaries find a Medicare plan that covers their specific medical and prescription drug needs at the lowest possible out-of-pocket cost.